ATLANTIS, Fla. – This weekend, the South Florida PGA Junior Championship Tour presented by The Honda Classic held the Power Crunch Junior Championship on the Golden Palm Course at Trump National Doral. The field featured many of South Florida’s top junior golfers. Port St. Lucie native Daisuke Nakano has been a big name in Junior Golf in South Florida over the past few years. Nakano, the 2016 South Florida PGA Championship Tour Player of the Year opened up round one with an even par-71. Nakano was 3-under-par on his round before finishing with a triple bogey on his final hole during Saturday’s round. Nakano found himself tied atop the leaderboard with Boynton Beach native Nicklas Staub heading into Sunday’s final round. 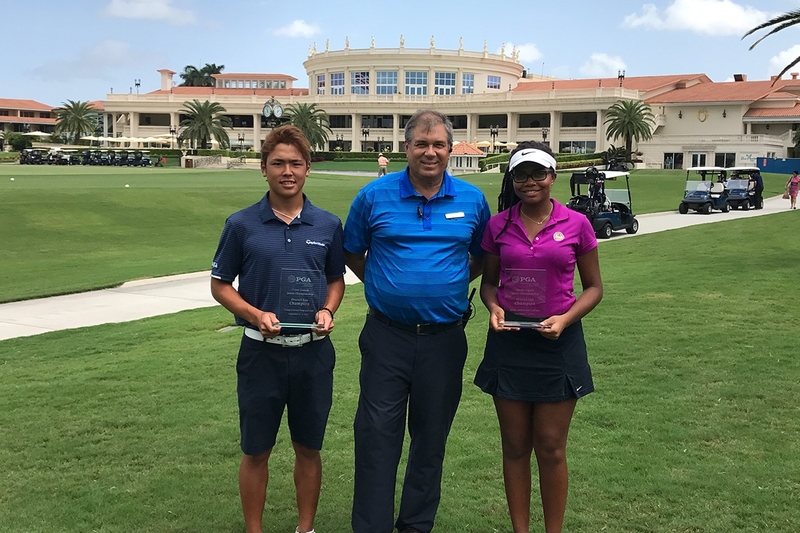 Nakano redeemed himself on the Golden Palm Course on Sunday after by a 4-under-par 67 to capture the overall boy’s championship by four strokes. Nakano’s round featured 5 birdies to just one bogey. Jupiter native Sabastian Nachilly took home the boy’s 13-15 age division are a solid weekend of 72-70 to finish at 1-under-par for the tournament. Davie native Derek Li would take home the boy’s 16-18 age division. Boynton Beach native Zora Gittens had a breakthrough weekend at Trump National Doral. Gittens opened up round one with an even-par 71 to take the early lead in the girl’s division. Doral native Skylee Shin put herself one stroke off Gittens lead after an opening round 1-over-par 71. Gittens put together a great final round 4-over-par 76 to capture the overall girl’s title by one stroke over Shin. Shin would capture the girl’s 13-15 age division, while West Palm Beach native Hannah Rizzolo would take home the girl’s 16-18 age division.